Born into a family of professional tabla makers from Miraj (India), Haridas Ramchandra Vhatkar marks the third generation of excellence in the art of tabla making, following in the footsteps of his grandfather Kerappa Ramchandra Vhatkar and father Ramchandra Kerappa Vhatkar. 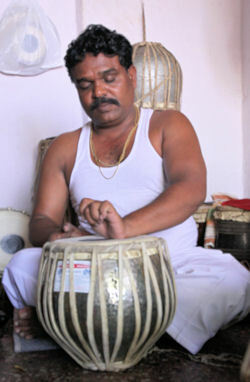 After dedicating himself to tabla making from an early age, Haridas continued to improve his art through experimentation and innovation, finally deciding to come to Mumbai in pursuit of his dream ...... To make a tabla set for tabla maestro Ustad Zakir Hussain !!! 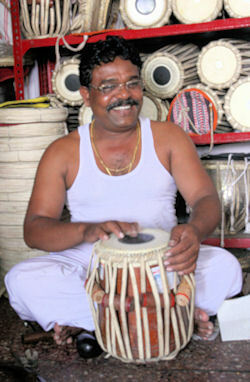 and started selling Haridas Vhatkar tabla from his shop in 1998. Impressed by his work, Shri. 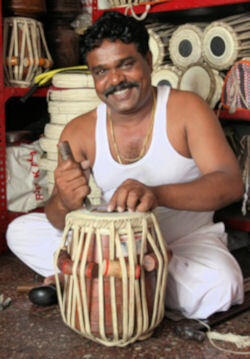 Yogesh Samsi showed one of his tablas to Ustad Alla Rakha, who then recommended his work to his son, Ustad Zakir Hussain. Impressed by his tablas, Ustadji immediately asked Haridas to make him a tabla ............ and that was the moment when Haridas's long cherished dream came true !!!. guidance, support, appreciation and encouragement. He is also associated with such artists as Fazal Qureshi, Shri. Vijay Ghate, Anuradha Pal, Taufiq Qureshi, Trilok Gurtu, Pandit Durgaprasad Mujumdar, Sivaman and, Talvin Singh. Haridas is committed to passing on his art to the next generation. 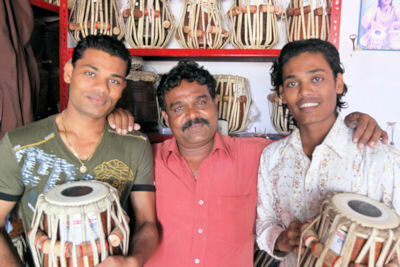 Today, his sons Kishore and Manoj represent the fourth generation of his family dedicated to mastering the art of tabla making and continuing the illustrious Vhatkar ineage of tabla makers.